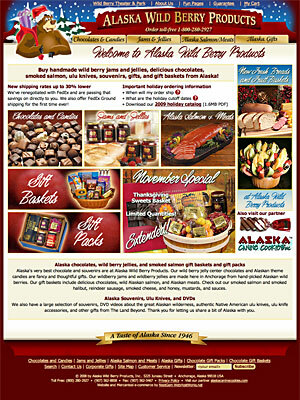 Alaska Wild Berry Products sells souvenirs and Alaska-themed gifts to tourist, locals, and Alaska fans throughout North America. In addition, they operate a small theme park and theater space that operates throughout the beautiful Anchorage summers. 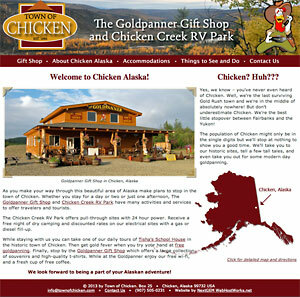 This website project combined a very substantial initial build with continuing periodic marketing initiatives including creation and management of their monthly email newsletter, catalog maintenance, search engine marketing and analytics, and seasonal graphics updates. 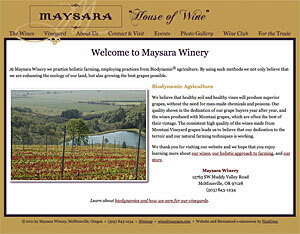 Maysara (which means "House of Wine" in ancient Persian) is a close-knit, family-owned vineyard and winery in the Willamette Valley viticultural area of Oregon. 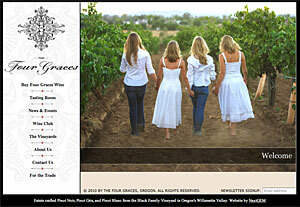 Their astounding Pinot Noir, Pinot Gris, and Pinot Blanc wines are starting to get the attention they deserve. 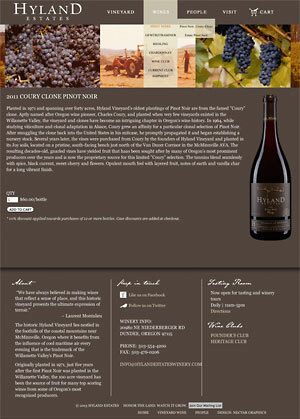 Their new website, launched in January 2011, highlights the beauty of the Maysara label style while providing all the functionality a winery requires including direct online sales, cellar club memberships and discounting, specialized shipping calculator, and content management for distributor sales materials. Lerant is a well-established high-end furnishings retail establishment in Houston Texas. 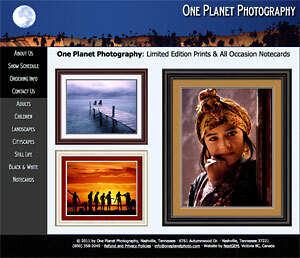 Building an elegant site is easy with such spectacular product photography. Unfortunately many online retailers skimp on this area. We were thrilled when Lerant went to the extra effort to provide extraordinary photos and it shows in the results. A major site redesign in 2014 continues to give their competitors a run for their money. For over 100 years W.J. 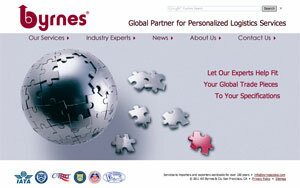 Byrnes of San Francisco has consulted in the complex field of international shipping logistics. Unfortunately their website was nearly as old as the business itself. In 2010 W.J. Byrnes hired us to rejuvenate the design and technologies. The client was closely involved with both the look and content and we are pleased to have developed their vision. Services included consulting which led to a migration to a new primary domain name, a long sequence of proffered designs with extensive input from the client, copywriting, complex form design, and custom backend data management tools. 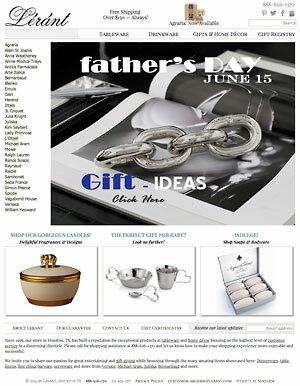 Their extensive collection of external links is unusual but fits their specialized needs. Artist websites have been a special interest of ours for many years and photography is particularly interesting due to the challenges of fidelity and merchandising of visual products on the web. 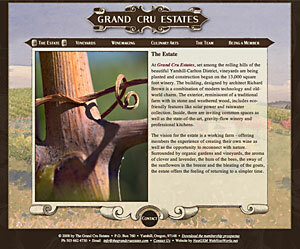 In late 2009 when their previous web developer suddenly went out of business this winery found themselves in a difficult and urgent situation. They chose to move their services to NextGEM because of our long history with successful Oregon wineries and our specialized winery website skillset. The design we migrated over was quite dated however and some of the choices made by the previous developers were holding our client back. We proposed — then delivered — a whole-site overhaul including reader-friendly colors and text formats, more rational architecture and navigation, valid HTML/CSS code, advanced display functionality, and content management tools so the client could update their own text and images. Of course we've found it's important when redesigning established sites to gently reincorporate enough of the previous design to give existing customers an experience that's consistent and familiar. That's why the web design should evolve smoothly. When it's time to update branding it should be done with respect and attention to what's come before. Art Fair SourceBook is a subscription service for professional artists who sell at the thousands of US art and craft fairs. They rely on AFSB to guide them through choosing and applying to the shows where they earn their living. AFSB compiles scores of organized data items for each of the fairs. We developed and maintain AFSB's website which includes 300,000 facts compiled in a powerful searchable database. Interactive calendar and mapping displays and automated reminder emails assist artists in planning their exhibitions. Finally, an online forum brings hundreds of artists together to discuss professional interests. This forum promotes site loyalty. 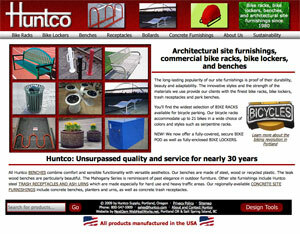 Huntco manufactures and markets architectural site furnishings such as bike racks, outdoor benches, and concrete ash cans to architects and commercial builders. By upgrading their previous design into a highly visual display, we've increased the visibility of their photography and the accessibility of their product documentation. 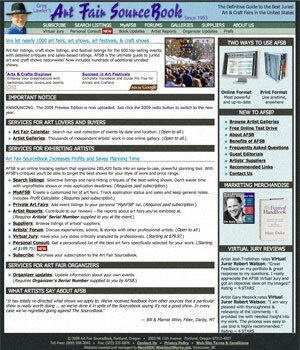 Chris Coffey, like about half of our clients, was starting his first website. 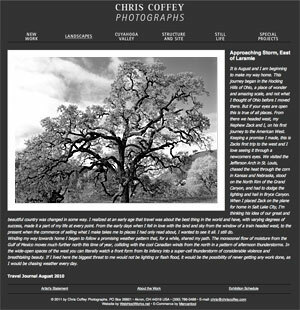 A talented photographer with ambition of expanding his business to include internet sales, his exquisite, highly artful black and white images require a totally focused display to keep the eye's attention on the detail. We recommended a black background to allow the images to speak for themselves. Chris Coffey's grand (and stark) black and white photography requires a special touch. The delicacy and power of his images can never be successfully reproduced on a computer monitor, but we've done our best with this intentionally minimalist, unornamented, greyscale design. An explosion in North American street food culture brings an explosion in street food websites. Hungry Rooster is a wholesale producer and retail purveyor of Polish perogies in innovated fusion recipes. 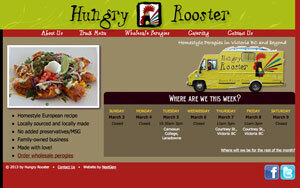 The Hungry Rooster website includes a back-end calendar management tool. 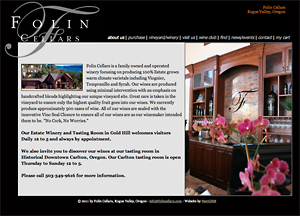 Folin Cellars asked us to transfer their website while integrating Mercantool e-commerce with some content management tools. At the same time we recognized the value of rewriting the HTML/CSS codebase for modernization, debugging accuracy, and general compatibility. By keeping their pre-existing general design we were able to keep the transfer and upgrade costs very reasonable. 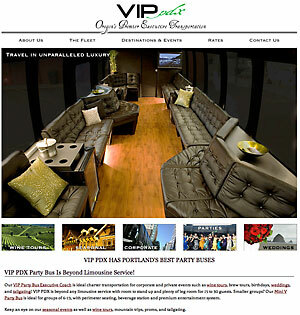 Starting with a do-it-yourself website, VIP PDX hired us to build a website more in keeping with their growing professionalism. The slideshow incorporated throughout the site give VIP PDX a chance to showcase their collection of photography and entice new customers. 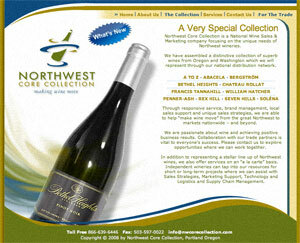 NW Core Collection serves wineries with complex distribution and research services. Our job was to develop sophisticated Content Management services through which NWCC could manage a vast store of marketing information for each of their clients. Initial discussions involved building this entire site in Flash, but after addressing the drawbacks inherent in that method, the client decided to build traditionally while aiming for the visual appeal of Flash sites. This compromise allowed us to achieve the important technical advantages of HTML/CSS. On this job we worked closely with the client's marketing manager who coordinated all copy, photography, and graphics assets as well as organized the client reviews. The job went smoothly and quickly and the results are excellent. 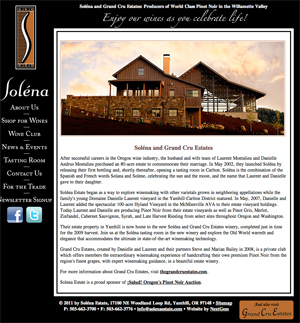 Solena Estate Winery is owned by the powerhouse team of Laurent Montalieu and Danielle Andrus Montalieu whose winemaking activities are spread throughout Oregon's famous Willamette Valley. Their flagship winery name is a combination of the Latin names for the Sun and Moon and is named after their daughter Solena.